There are NHL offenses that make hay with an exceptional first line. There are those which collect modest scoring from a committee of players. The Penguins lead the NHL in scoring with 244 goals through 75 games, a 3.25 goals per game average that is being padded up and down the lineup. Snipers and grinders alike are enjoying career seasons as the Penguins continue their throwback offensive campaign. Players like Evgeni Malkin and James Neal have established scoring pedigrees, but their contributions are being matched by career seasons from grinders like Pascal Dupuis, Matt Cooke and others. Part of their shared success may come from their shared time on the ice. The recent offensive successes have been smashing. Since February 1, the club has averaged 3.76 goals per game, have three eight-goal games in that span and have scored 34 times in the seven games Crosby has played in March—4.75 per game. Much of the scoring has come from the top trio of Malkin, Neal and Chris Kunitz, who have accounted for 104 goals and 122 assists. Those 226 combined points account for over half of Pittsburgh’s 433 total points (52.0 percent) this season. The gaudy percentage is indicative not of slack scoring all around, but of a monster season from the first line. Dupuis and Cooke have joined Neal in setting career highs in goals and points this season. 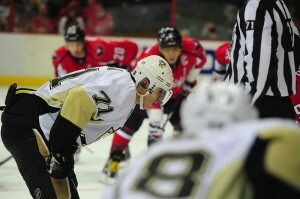 Kunitz is three goals and eight points shy of his career bests (25 and 60 in 2006-07). Malkin is on pace for his third career 100-point season, albeit with the highest PPG average of his NHL tenure (he’ll finish with fewer games played than in his 100-plus point seasons in 2008 and 2009). Five Penguins have scored 20 or more goals this season. Only Boston has as many players with 20 or more. How good is this Penguins offense? Cooke’s next goal—and his spot alongside Crosby suggests reaching the plateau is only a matter of time—will give the Pens six 20-goal players for the first time since 1995-96. That season, Mario Lemieux reached 161 points. He and Jaromir Jagr both topped 60 goals that year, the second of seven straight seasons in which the Art Ross Trophy was presented to either Lemieux or Jagr. Due to various injuries, Malkin and Sidney Crosby probably won’t match such levels of scoring dominance. Injuries have already limited what’s already been a big offensive year. Jordan Staal might have set career-bests if not for 20 games lost to injury. The same goes for Kris Letang, whose PPG average is the best of his career but whose totals won’t be. Crosby’s ailments have limited him to 15 games all year. In those games, he has recorded 25 points. That projects to 137 over a complete 82-game season. It’s a fair projection, given that Crosby was on pace for 132 after 41 straight games last season before being concussed. In spite of what might have been, Pittsburgh’s offense still paces the NHL and the glut of goals suggests it’s a lead they won’t relinquish heading into the playoffs.